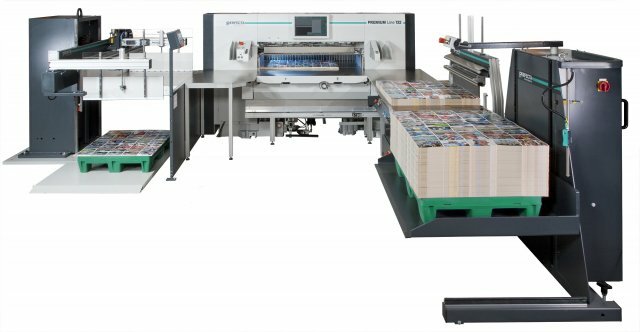 The portfolio of PERFECTA includes various machines of the pre-press stage. The focus of the company mostly was and is the PERFECTA High-Speed cutting machine. The cutters designed by our engineers are part of a new, most innovative machine generation and are leading in the use of industrial technologies. Whether as a stand-alone machine or as the central unit of a cutting system - PERFECTA High-Speed Cutters are state of the art when it comes to cutting of paper, cardboard, aluminum or sorts of plastics. A PERFECTA machine is a major key for a efficient pre-press workflow. Our cutting machines conjoin innovative technology, solid design and high-performance electronics. - PREMIUM Line for a complete range of equipment and maximum automation, individually arranged and adopted to your workflow. - ECO Line for the standardized and efficient workplace of cutting. The PERFECTA collection is furthermore conjoined by various Peripherals. These machines will increase the efficiency and ergonomics of every cutting machine workplace before, during and after the cutting process. PERFECTA offers highest quality and reliability from the classic stand-alone machine up to the fully automated cutting system for more than 120 years now. Furthermore PERFECTA Pile Turners, as well as Three-Knife-Trimmers and Perfect Binders are a constant part of the product portfolio.